Miller, William B. 2018. Biological information systems: Evolution as cognition-based information management. Progress in Biophysics and Molecular Biology, Vol. 134, Issue. , p. 1. SWENSON, SARAH A. 2015. ‘Morals can not be drawn from facts but guidance may be’: the early life of W.D. Hamilton's theory of inclusive fitness. The British Journal for the History of Science, Vol. 48, Issue. 04, p. 543. Leggett, Mike 2010. Camoupedia— A Compendium of Research on Art, Architecture and Camouflage by Roy R. Behrens. Bobolink Books, Dysart, IA, U.S.A., 2009. 464 pp., illus. Paper. ISBN: 0-9713244-6-8. Leonardo, Vol. 43, Issue. 3, p. 297. Wilson, Stephen 2010. Invisible Vision: Could Science Learn from the Arts? by Sabine E. Wildevuur. Bohn Stafleu Van Loghum, Uitgever, NL, 2009. 190 pp., illus. ISBN: 978-9-03-135101-5. Leonardo, Vol. 43, Issue. 3, p. 299. Mojica, Martha Patricia Niño 2010. Speclab: Digital Aesthetics and Projects in Speculative Computing by Johanna Drucker. University of Chicago Press, Chicago, IL, U.S.A., and London, 2009. 264 pp., illus. Trade, paper. ISBN: 978-0-22-616507-3; 978-0-22-616508-0. Leonardo, Vol. 43, Issue. 3, p. 302. Grigar, Dene 2010. Ex-foliations: Reading Machines and the Upgrade Path by Terry Harpold. University of Minnesota Press, Minneapolis, MN, U.S.A., 2009. 365 pp., illus. Trade, paper. ISBN: 978-0-81-665101-6; ISBN: 978-0-81-665102-3. Leonardo, Vol. 43, Issue. 3, p. 293. Barber, John F. 2010. Sonic Mediations: Body Sound Technology edited by Carolyn Birdsall and Anthony Enns. Cambridge Scholars Publishing, Newcastle upon Tyne, U.K., 2008. 286 pp., illus. Trade. ISBN: 1-84718-483-9. Leonardo, Vol. 43, Issue. 3, p. 295. Nappi, Maureen 2010. Bits of Life: Feminism at the Intersections of Media, Bioscience, and Technology edited by Anneke Smelik and Nina Lykke. In Vivo: The Cultural Mediations of Biomedical Science Series, University of Washington Press, Seattle, WA, U.S.A., 2008. 240 pp., illus. Paper. ISBN: 978-0-29-598809-2. Leonardo, Vol. 43, Issue. 3, p. 296. Costantini, Giovanna 2010. Bill Viola in Conversation with Adam Weinberg, 27 October 2009, The Whitney Museum's 2009 Annenberg Lecture. Event web site: 〈http://whitney.org〉. Leonardo, Vol. 43, Issue. 3, p. 291. Harle, Rob 2010. And While I Have Been Lying Here Perfectly Still: The Saskia Olde Wolbers Files by Philip Monk. Art Gallery of York University, Toronto, Canada, 2009. 136 pp., illus. Paper. ISBN: 978-0-92-197253-2. Leonardo, Vol. 43, Issue. 3, p. 300. Sharma, Aparna 2010. Art for a Modern India, 1947–1980 by Rebecca M. Brown. Duke University Press, Durham, NC, U.S.A, and London, U.K., 2009. 196 pp., illus. ISBN: 978-0-82-234375-2. Leonardo, Vol. 43, Issue. 3, p. 300. Ione, Amy 2010. Everyday Creativity: Shared Languages & Collective Action 7th Creativity and Cognition Conference, 27–30 October 2009, Berkeley Art Museum and the University of California at Berkeley. Leonardo, Vol. 43, Issue. 3, p. 292. Mosher, Michael R. 2010. Otaku: Japan's Database Animals by Hiroki Azuma; Jonathan E. Abel and Shion Kono, trans. University of Minnesota Press, Minneapolis, MN, U.S.A., 2009, 200 pp., illus. Trade, paper. ISBN: 0-8166-5351-5; ISBN: 0-8166-5352-2. Leonardo, Vol. 43, Issue. 3, p. 298. Enns, Anthony 2010. Digital Contagions: A Media Archaeology of Computer Viruses by Jussi Parikka. Peter Lang, New York, U.S.A., 2007. 327 pp., illus. Trade, paper. ISBN 978-1-43-310093-2; ISBN: 978-0-82-048837-0. Leonardo, Vol. 43, Issue. 3, p. 294. Baetens, Jan 2010. Digital Material: Tracing New Media in Everyday Life and Technology edited by Marianne van den Boomen, Sybille Lammes, Ann-Sophie Lehmann, Joost Raessens and Mirko Tobias Schäfer. Amsterdam University Press, Amsterdam, NL, 2009. 304 pp., Paper. ISBN: 978-90-8964-068-0. Leonardo, Vol. 43, Issue. 3, p. 301. 2010. Leonardo Reviews On-Line. Leonardo, Vol. 43, Issue. 3, p. 303. 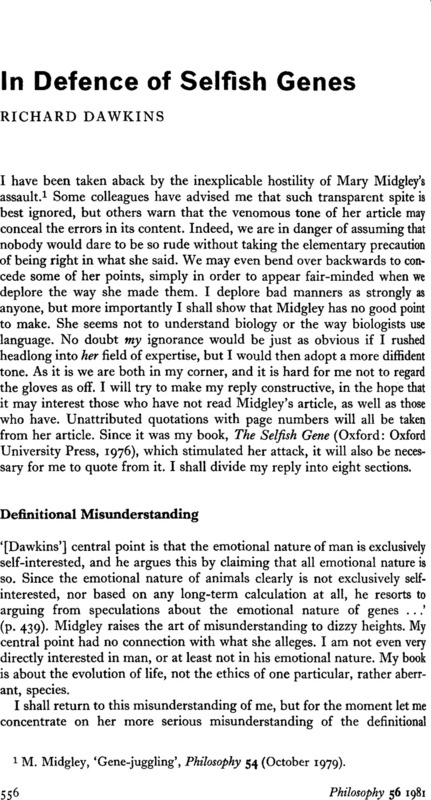 1 Midgley, M., ‘Gene-juggling’, Philosophy 54 (10 1979). 3 Dawkins, R., ‘Replicator Selection and the Extended Phenotype’, Zeitschrift für Tierpsychologie 47, 61–76. 4 It is hard to resist a flourish as I quote almost exactly the same words from a recent, forward-looking review by Francis Crick, architect (with J. D. Watson) of the modern molecular concept of the gene: ‘The theory of the “selfish gene” will have to be extended to any stretch of DNA’ (Crick, F. H. C., ‘Split Genes and RNA Splicing’, Science 204 (1979), 270). Crick's point is elaborated in two further molecular biological papers whose titles betray no coy reticence about applying the word ‘selfish’ to DNA molecules! (Orgel, L. E. and Crick, F. H. C., ‘Selfish DNA: the Ultimate Parasite’, Nature 284 (1980); Doolittle, W. F. and Sapienza, C., ‘Selfish Genes, the Phenotype Paradigm and Genome Evolution’, Nature 284 (1980). As for my definition of the gene, its derivation from Williams is not word for word, but I have conveyed the clear message of pp. 22–25 of his Adaptation and Natural Selection (New Jersey: Princeton University Press, 1966). My definition is a rendering, for laymen, of two technical sentences from these pages of Williams: ‘I use the term gene to mean “that which segregates and recombines with appreciable frequency”’; and ‘a gene could be defined as any hereditary information for which there is a favorable or unfavorable selection bias equal to several or many times its rate of endogenous change’. 5 Benzer, S., ‘The Elementary Units of Heredity’, The Chemical Basis of Heredity, McElroy, W. D. and Glass, B. (eds) (Baltimore: Johns Hopkins, 1957). 6 Hull, D. L., ‘The Units of Evolution: a Metaphysical Essay’, Studies in the Concept of Evolution, Jensen, U. J. and Harré, R. (eds) (Hassocks: The Harvester Press, in press). In view of her spirited remark that I should either learn to do metaphysics or retreat out of sight altogether, Midgley might be amused at the following from Hull's manuscript: ‘Although he is likely to be shocked, if not offended, at being told so, Dawkins (1976, 1978) has made an important contribution to the metaphysics of evolution in his explication of “replicators”. Like Monsieur Jourdain, who was astonished to discover that he had been speaking prose all his life, Dawkins may well be equally surprised to discover that he has committed an act of metaphysics’. 7 Gould, S. J., ‘Caring Groups and Selfish Genes’, Natural History 86 (12 1977). Gould is a well-known palaeontologist who would probably be surprised at Midgley's description of him as ‘a geneticist’ (Beast and Man, 66). Midgley, in turn, might be surprised at some of the things Gould has written elsewhere, for instance: ‘Natural selection dictates that organisms act in their own self-interest. They know nothing of such abstract concepts as “the good of the species’. They “struggle” continuously to increase the representation of their genes at the expense of their fellows. And that, for all its baldness, is all there is to it; we have discovered no higher principle in nature’ (Gould, S. J., Ever Since Darwin (London: Burnett Books, 1978), 261). 8 In Hamilton's opinion too, as is clear from his reviews of both our books (and by the way, nobody in the world is better qualified to review either of them): Hamilton, W. D., review of The Selfish Gene (Science 196, 1977, 757–759); Hamilton, W. D., review of Sociobiology (Journal of Animal Ecology 46, 1977, 975–983). 9 Some of the more constructive arguments in this paper are developed further in my forthcoming book, The Extended Phenotype (Oxford: W. H. Freeman & Co., 1982).